Audacity and humor are more effective tactics for achieving social change than are rage and fury. According to Gandhi: “The role of a civil protester is to provoke a response, and to keep protesting until there is a response.” In the context of tactical nonviolence, neither the protester’s actions, nor the responses they provoke, are ends in and of themselves. Rather they are a means of building a popular political movement capable of forcing (or resisting) some change. In the winter of 1963-64, Congress of Racial Equality (CORE) chapters in the SF Bay Area campaigned against racist hiring practices by the Lucky Market chain (now Albertsons). When negotiations with Lucky failed to produce an agreement, CORE began leafletting and then picketing some of the stores to educate customers about job discrimination in general, and Lucky’s policy of hiring only whites for all positions above janitor. Shoppers confronted with a picket line came face-to-face with the issue as activists urged them to boycott Lucky and buy their groceries elsewhere. When there was no response from the Lucky management, CORE mounted “shop-ins” at a few of the stores — a tactic that broke the sacred taboos of private property, but without violence against people. 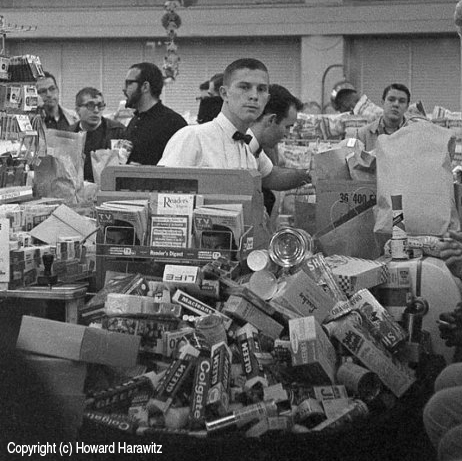 After picketing and leafleting the store for long enough to ensure that everyone inside knew and understood the issue, CORE members entered the market, filled shopping carts with groceries of all kinds, and proceeded to the check-out counter where the merchandise was rung up and bagged by the (all white) clerks and bag boys. When presented with the bill, the CORE activists replied, “We won’t spend our money with a company that practices racism.” Then they walked out leaving the bagged goods behind. Soon the shelves were practically empty and everything was piled up around the check-out stands. Business was halted for hours while the groceries were laboriously unsorted and the shelves restocked. Consternation ensued. Business had been disrupted, property had been mishandled, ice cream had melted, some cakes had been crushed. The social order of custom and courtesy had been violated. “Innocent shoppers” had been inconvenienced. Pundits and editorials denounced CORE’s “coercive” tactics. But supporters of racial justice countered by raising the long-term economic and social devastation of systemic discrimination, and Lucky’s role in perpetuating a system that was inherently unjust and socially destructive. Lucky had many stores across the Bay Area, only a few were picketed and fewer still had shop-ins, but word-of-mouth and media coverage spread the issue far and wide. And it was impossible to talk about the shop-in without also talking about Lucky’s racist hiring practices. All of which built mass support for the boycott. CORE had a few hundred activists, and only a portion of them participated in the shop-ins, but those actions caused tens of thousands to view Lucky as a racist company they did not want to do business with. Shortly after the shop-ins, Lucky signed an agreement with CORE to integrate its work force. Other grocery chains followed without requiring direct-action. In the American South of the 1960s, simply asking for a cup of coffee, carrying a freedom sign, or attempting to register to vote, was enough to provoke a response — in many cases a violent response — from those determined to maintain the Jim Crow system of racial apartheid. But in the North, and in later decades and other struggles, more sophisticated and powerful adversaries learned to ignore small protests. When actions produce no response they appear futile (though, in fact, they may not be). Protesters feel impotent and become discouraged. It becomes harder to build a movement that can affect social change. When protesters are ignored, they often react with rage. That might be an effective tactic in a family or social situation where expressed anger commands attention and disrupts a valued harmony. But against entrenched power defending its privileged interests, shouting fury is simply a louder form of futility. It may feel good for a moment, and it may energize that fraction of the population who are thrilled by acting out anger in public. But power-elites are impervious to militant slogans, and if rage erupts into violence, the police are ready, willing, able, and eager to quickly suppress it long before it poses any inconvenince to distant rulers safe and secure in their bastions of wealth and privilege. An unprovoked, aggressive police attack on nonviolent demonstrators builds public sympathy for both the activists and their cause; but when protestors initiate or commit violence (or it can be made to appear as if they have done so), public reaction is quite different. Those already firmly committed to the cause may cheer and applaud, but few potential adherents are won, and many current supporters are alienated. Even violence by just a small fraction of the participants taints everyone, and the cause itself, in the eyes of the public. Despite our mass culture’s glorification of violence, the overwhelming majority of people — even young people — are frightened and repelled by actual violence. And that which people fear, they come to hate. And what they hate, they oppose. Over the past decades it’s been proven time and again that ultra-militant sects who deliberately use violence to provoke a police response remain small, isolated, ineffective, and ultimately impotent — filled with sound and fury, signifying nothing. Instead of using rage and violence to provoke a response from adversaries who ignore traditional protests, creative nonviolent resistors use audacity to generate a, “They did what! ?” response. In this context, “audacity” means breaking the paradigm of business-as-usual social behavior. Audacity is doing the unexpected. Audacity is violating cultural taboos in ways calculated to provoke a reaction without alienating potential supporters. The Lucky shop-ins were an example of creative audacity. Like audacity, satire and humor are also techniques of nonviolent direction action. Laughter and ridicule undermine authority and diminish its ability to compell obedience. You can weaken, unbalance, and ultimately overthrow the king quicker by laughing at him than by futilely screaming fury at him. Humor appeals to observers and potential supporters. Fury frightens and alienates them. Humor disarms and confuses adversaries. Rage triggers engrained patterns of defense and counter-rage, stokes resistance, and mobilizes fiercer opposition. Humor is more sustainable than fury. Anger is exhausting. Most people cannot sustain intense rage over long periods of time. But humor is energizing, both in the short-run of a single protest, and in the long-run of an extended campaign. Humor and audacity work hand-in-hand, reinforcing each other. Humor reduces and difuses hostile reaction to broken taboos, and nothing spreads faster by word-of-mouth (or twitter tweets) than tales of audacious humor. In 1964, after careful investigation and lengthy negotiations, CORE in California launched a state-wide job discrimination campaign against Bank of America (BofA). Cashier, clerk, teller, and desk jobs were for whites only — Blacks, Latinos, Asians, and Native Americans need not apply. Bank jobs were desirable back then, they were among the few decently-paid, white-collar jobs a person could get without a college degree. This was before ATMs, a time when few people had credit cards and there was no “cash back” at stores. Friday afternoons were the busy time because everyone had to stand in line to deposit their pay checks and withdraw spending money for the weekend. So every Friday afternoon, leaflets were distributed and picket lines established at BofA branches in locales where CORE had chapters. BofA customers were asked to shift their accounts to other banks (of which there were many). through the pickets outside, so we felt they needed additional encouragement to take their business elsewhere. A good coiner could hold up a line for 10, 15, 20 minutes. When the managers opened up new windows, we’d send in more coiners. Some of the tellers and most of those fuming in line behind us were outraged — we were breaking the taboos of courtesy, the taboos of lines, the taboos of efficient business. We were breaking the sacred taboo of reverent worship in the temple of money. But some of the customers and clerks grasped the inherent comedy in the situation, and others were influenced by our deliberately maintained demeanor of good humor. This helped some of them see beyond the immediacy of the moment and understand that the root cause of their inconvenience was BofA’s racist hiring practices. Then we learned that as a matter of law it was not necessary to use the pre-printed checks supplied by the bank. So long as all the information was there, we could write a check on anything. So we started “cash-ins.” We opened a small checking account, and used magic marker to write $1.00 checks on the back of our “Bank of America Discriminates” and “Stop Racism” picket signs. When we entered with our signs on their long sticks the managers rushed up, “You can’t picket in here! This is private property! “Oh, we’re not picketing,” we responded with good cheer, “we’re here to cash a check. See, it’s written out right there.” Again, many were shocked, but even a few of the managers had to laugh. A week or so later we got a call from one, he told us they couldn’t send our cancelled picket signs (checks) back through the mail, did we want to pick them up at the branch? We did. Although BofA refused to sign a formal agreement with CORE the way Lucky Markets had, they did end race-based job discrimination. Within a year people of all colors were hired into white-collar positions. Other banks followed suit. That was long ago, but the passage of time has shown that stories of audacity and humor are told, and retold, and remembered, in ways that more conventional protests are not. In 47 years of political activism I’ve been on marches and picket lines uncounted, almost all of which have blurred and disappeared into the musty attic of what’s left of my memory. But I still recall in detail those coin-ins and cash-ins. And what’s true of my feeble memory is true for history as well. To this day, most every child and adult in America can tell you the basic story of the Boston Tea Party — an audacious nonviolent protest back in 1773. Yet the same grade-school teacher and textbook that taught us the Tea Party also taught us the Battle of Saratoga — a crucial (but conventional) military turning point in the Revolutionary War — yet once the classroom test was over, no one but history buffs and professors recall Saratoga at all.